Have you ever had a friend or family member with some degree of interest in investigating the evidence for Christ but is hung up on a spiritual sticking point? This struggle is often expressed by people with intellectual issues blocking their spiritual path. Sometimes people reject the evidence as a way to hide their real concern that becoming a Christian would mean a radical life change that they’re just not open to. People get confused because they hear all kinds of interpretations of the Bible. Spiritual Sticking Point #4: I Do Believe; Isn’t That Enough? Viggo Olsen was a brilliant surgeon, and at one time he and his wife, Joan, were skeptics who thought modern science proved that the Bible was based on mythology. As he committed himself to pursuing his questions, he came to the same conclusion that so many others have—the story of Jesus is true, and advances in many areas of science point powerfully and persuasively toward a Creator who looks a lot like the God of the Bible. In his book, The Agnostic Who Dared to Search, Olsen stated that he and his wife took the risk of discovering the truth. Other people have a similar kind of hidden obstacle: the fear of intimacy. They aren’t afraid of Christ changing their life; their unspoken fear is of intimacy. They feel attracted toward God, but they recoil from the prospect of relating to anybody on a deep level. One other variation of this spiritual sticking point is a hidden authority obstacle. A person who struggles with this doesn't want anyone—including the God who created them—to tell them how to live their life. So they find reasons not to believe. But they’re missing the point: God’s goal isn’t to boss us around, but to guide us into our greatest purpose and potential and to protect us from our own self-destructive behavior. People get confused because they hear all kinds of interpretations of the Bible. They see different denominations. They hear some people who take the Bible literally and some who say it’s just a general moral guideline. They hear people using the Bible to support contradictory positions. They try reading the Bible and get bogged down in Leviticus. The key to accurately understanding the Bible is the same as the key to understanding any communication—you must study to determine what the writer actually meant. Not what we want it to say; not to interpret it for our benefit; not to read our biases into it—but to figure out what the writer intended to communicate. Now, there are difficult sections of the Bible, and well-intentioned people can legitimately debate the finer points, but when it comes to the critical central message of what you and I need to know the most, there’s no ambiguity. You don’t have to know everything about the Bible to know something. And that verse is clear about the central truth you need to know. There’s no ambiguity or confusion about it. Believing is the first step, but we must also receive! Romans 6:23 says that eternal life is a free gift—but think about a Christmas gift. It doesn’t become yours until you reach out and receive it. Otherwise, it sits unclaimed and unopened under the tree. You believe…Now come and discover the evidence to back up your faith. 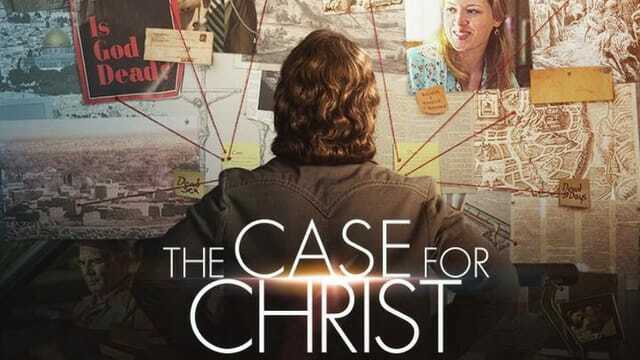 The Case for Christ is a film you won’t want to miss. Come and experience this compelling journey where challenging questions about Jesus and Christianity are explored and answered.